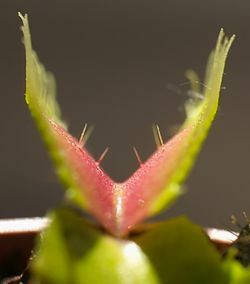 The Sundew family consists of the well known Venus flytrap which is located in Carolina. The sundew is also largest carnivores plants which consist of at least 194 species. These plants capture and digest insects. The Droseracae or most commonly referred to as the Sundew Family are perennial herbs. These plants are usually stuck to the base of plant and the leaf blade is covered with hairs that secrete mucilage. The insects that can get attracted to it can become stuck to the plant then digesed for food. The plant or flower is actinomorphic which means that they both have pollen bearing and ovule bearing parts. The overall design of the plant is that iti has five sepals that are at the base of the plant and has five distinct petals and five stamens. Some more details about the sundew family anatomy is they are perennial ,but some can also be annual but that is only consisted in very rare varieties. There height can vary to about 0.4 to 39 inches , but this will depend on the variety of the plants. Also the climbing variety can go to 10ft. Most of the sundews are usually self productive because they self pollinate when they are closing. For some the vegetative reproductive crops they will they will grow naturally producing stolons and the species is when the roots reach closer to the surface of the soil.. For example the venus flytrap reproduces through pollination and by forming bulbs. Also a venus flytrap life cycle go's up to about seven years. The Sundew family is most commonly found in boggy areas such as hot area with very poor soil conditons. The sundews can live in both hot or cold conditions. With the plants abillty to eat or digest insects it can survive in the most depleted areas around the world. Sundews do share there habitat with others such as the most common of them all the venus flytrap which is most commmonly located in North Carolina. Most of the sundews are usually found growing next to a moss called the sphagnum. The Sundews can also be affected by aphids,mealybugs, scale, squarrils, raccons, birds and fungus. They also consist of 194 species and are the largest carnivours plants. Some interesting facts about the sundews is that is that the they get there name from glistening, sticky, hairlike trickomes. 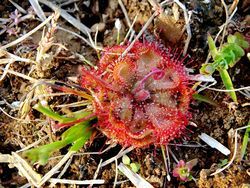 Another interesting fact is that Charles Darwin was very found of the sundews he said "It is a wonderful plant, or rather a most sagacious animal. I will stick up for Drosera to the day of my death,”. ↑ Family: Droseraceae Go Botany. Web. Accessed May 07,2017. Author Unknown. ↑ Sundews- Encompassing One of the Biggest Varieties of Carnivorous Plants Carnivorous--Plants. Web. Accessed May 10,2017. Author unknown. This page was last modified on 27 May 2017, at 22:22.